Delightful Doggie 4 U readers we are going to have some dog breeds recognized by the American Kennel Club today with their pictures and a little something about them for your reading pleasure seriously hope you enjoy these. 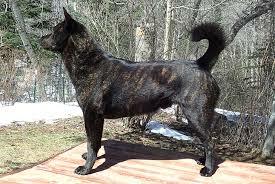 The Kai Ken originated in Japan being bred for centuries they are a rare dog even in its native land. 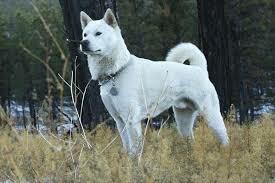 Being one of the six breeds of dogs from Japan it is protected by the Nihon Ken Hozonkai. (Chu-Tora), and red brindle (Aka-Tora). Red brindle is the rarest of the three distinctive coat colors, when born the Kia Ken is usually all black the brindle will emerge as they grown and continue to change for the first five years, the brindle pattern will vary from dog to dog as well as the actual pattern. Kai Ken are athletic and have a strong desire to hunt, excellent swimmers and climbers they have been known to swim rivers and climb trees in pursuit of game. As a family pet this breed is loyal, alert, agile, intelligent, reserved, brave, a trustworthy guardian, extremely devoted to their master, with the high intelligence they learn quickly and are more willing to please their companions. A breed that is good with children and can adapt to apartment living with regular exercise in the form of leashed daily walks they are not an aggressive breed so other dogs are not a problem at the dog park. The breed is a clean breed brushing daily is recommended especially during the twice-a-year shed bathing should be limited to only when necessary. Kia Ken are independent thinkers with strong family ties and make great guard dogs. 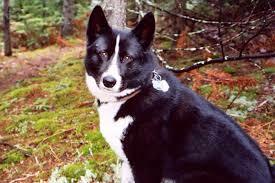 The Karelian Bear Dog originated in Finland, it is regarded as a national treasure in its home country. They were bred for hunting a variety of animals its fearless nature has made the breed highly popular for hunting big aggressive game including bear, moose, and wild boar. A medium-sized breed standing 19 to 24 inches at the shoulder, weighing 44 to 51 pounds, and having a life expectancy of 11 to 13 years, the fluffy double coat of dense fur reduces the risk of frostbite and their native land. This breed is an eager hunter very independent but works cooperatively by barking to mark the game. Their high developed spirit for any game hunting and self-confidence makes them an excellent breed for hunting big game. This is a silent hunter led by his sharp sense of smell and only barks once he has the game stopped or treed. He communicates with the hunter the type of animal he has located by the sound of his bark. 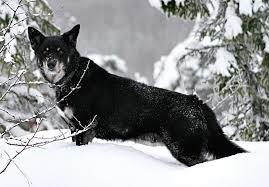 A Karelian Bear Dog is territorial, cautious, tenacious, loyal, independent, brave, and he can demonstrate self-control around people, but the fighting spirit surfaces around other dogs and he can be difficult to handle when faced with a challenge. The spirit easily turns into aggression all this dog loves is a challenge as a family pet raised with children he will be playful but he can be intense and has a tendency to play rough. Not a recommended breed for the elderly or families with small children these dogs need open areas not good for apartment living. The Keeshond originated in Holland a medium-sized breed whose closest relatives are the German Spitz, such as the Großspitz, Mittelspitz, and Kleinspitz, and the Pomeranian. Keeshonds are obedient, agile, playful, bright, sturdy, quick, and good-natured. Being a cuddly breed they are great for a family with children and socialized as they grown will get along well with other dogs and pets. Due to the minimum exercise requirements apartment living is not a problem so for the elderly or city folks they are a wonderful companion pet. 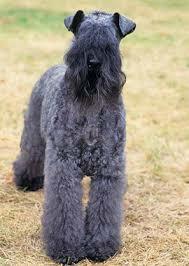 The Kerry Blue Terrier originated from Ireland bred to control “vermin” including rats, rabbits, badgers, fox, otters, hares, and others. Over time they became a working dog used for herding cattle or sheep, and used as a guard dog. Being one of the largest terriers they stand 17 to 20 inches at the shoulder, weigh 33 to 40 pounds, and have a life expectancy of 13 to 15 years, this breed is considered to by hypoallergenic. The soft blue coat is dense in shades of blue that range from a deep slate to a light blue-gray color, with a sporty beard and the curly hair turning heads where they go. A Kerry Blue Terrier will make a wonderful family pet for children because they enjoy all family activities and being with the people they love makes them the happiest. Being affectionate, loyal, alert, spirited, strong willed, and gentle this working farm dog has adapted into a great companion or family watchdog today. Needing daily exercise they can adapt to apartment living with daily walks just not to the dog park as they are not especially good-natured toward other dogs. 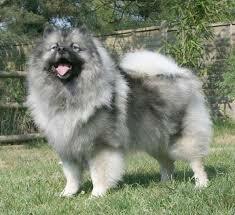 The Kishu Ken originated in Japan one of the Spitz-type breeds developed there for thousands of years for hunting. They are similar to the Hokkaido, Shikoku and the Kai Ken. Of medium size they stand 17 to 22 inches at the shoulder, weigh 30 to 60 pounds, and have a life expectancy of 12 to 15 years, the dense coarse double-coat is short and straight and comes in white, brindle, red, and sesame. A high prey drive for small animals most times they cannot help but give in to their instincts for the chase of the hunt, and known for their endurance need a fenced in area or to be leashed when out and about. A Kishu Ken is docile, alert, dignified, noble, faithful, and although they are an easy-going house dog they do not make a good breed as a companion for the elderly with a high activity level required from their owner. As a family pet they can do well with children if they are raised with them and the children are taught not to tease or abuse the dog. A breed that needs to be included in activities they are a great pet for active people who spend time outdoors and can expel the energy of them. They do tend to be often be aloof with strangers socialization when young with the people that are going to be part of every day life with them is a great idea. 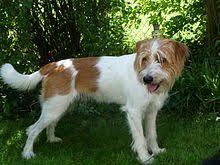 The Kromfohrländer originated in Germany a breed used as a companion dog. Pronunciation of the breed is “krome-for-lahn-dair.” It is believed to be descended from a dog of mixed heritage that likely included some Terrier, Hound or Herding ancestors. This medium-sized breed stands 15 to 18 inches at the shoulders, weighs, 20 to 35 pounds, and has a life expectancy of 17 to 18 years, they come in two coat types the wire haired (with beard) and the smooth haired (smooth face with no bread and long soft hair). Coat colors can be found in two shades the brown & white and the white & tan. The distinctive “smile” of the breed is adorable and very likely they will sneeze to greet you their way of saying “hello”. Nicknamed the “Kromi” (krome-ee) in the States these dogs retain very little hunting instinct despite the terrier heritage. Bred as a companion the docile, good-natured, spirited, companionable, adaptable, trainable, sensitive, loving, loyal, agile, intelligent, and funny they become very attached to their owner and will not run away. With their high agility they love to climb and jump and can easily excel at agility and trick training. Good with children and family they tend to be a one-person dog and is first to alert you to any strangers being adaptable to apartment living are great for the elderly due to their loyalty to one person. One note to keep in mind they can be fussy with food. 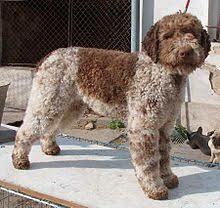 The Lagotto Romagnolo originated in a sub-region of Italy known as Romagna hence the name which means “lake dog from Romango”, traditionally used as a gun dog as a water retriever, however, it is also used to hunt for truffles. Another of the hypoallergenic breeds they stand 15 to 19 inches at the shoulder, weigh 24 to 35 pounds, and have a life expectancy of 15 to 17 years, the curly coat that covers head to tail is crowned by a facial beard, eyebrows, and whiskers that are not only sporty but adorable. These curls feel and act like human hair as opposed to fur and gives them the hypoallergic category making those with allergies most pleased to own this breed. You can find this curly breed in brown roan, orange & white, brown & white, brown, orange, and off-white colors. The breed is loyal, keen, companionable, loving, active, trainable, gentle, and affectionate, but not craving in a demanding way of human companionship. Trained and socialized properly they are especially good with children and can behave inside the house. As a watch dog they will do well should strangers enter their territory barking to alert the owner. Some in this breed will suffer from separation anxiety so it is never a good idea to leave them alone too long. A good companion to those who have the strength to handle them because they are a strong dog. The Lapponian Herder originated from Finland one of three Lapphund breeds developed by the Sami people for herding and guarding their reindeer. Medium sized standing 17 to 21 inches at the shoulders, weighing around 70 pounds, and having a life expectancy of 12 to 14 years, the medium length coat makes them easy to maintain a perfect fit for any experienced dog owner. This breed comes in many colors including gray-brown, black often with lighter undercoats, and white or tan markings. A high-energy herding breed they will excel in other dog sports besides herding the love of hard work makes them a wonderful breed for any companion event that is competitive and fun. 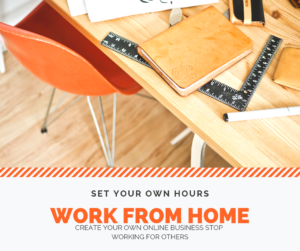 With a well-rounded breed as this you can have a dog that fits perfectly into any environment with a job to do they will be content and happy. Known for being docile, energetic, friendly, vocal, calm, and protective, with children they may try to herd them when playing, including nipping at their legs and barking. A patient breed with other dogs and small pets with his eager to please temperament as a companion he can even do well for the elderly with proper exercise daily. And yes they do make a good watch dog having a tendency to be aloof with strangers. The breeds I have listed today include a number of ones that would make good guard dogs or watch dogs for you and your family. Some are not advised for the elderly due to the strength of the dog itself when walking is required. Although, I know that I have mentioned this before please take the time to check the breeder if you are planning to purchase any of the breeds I am writing about here on my website. Not all breeders can be trusted and checking them for reliability is highly encouraged so you do not end up with an inferior puppy or sick one either. Remember puppies do not stay small and cute forever you are getting a lifetime commitment to take care of the dog for its life which is not as long as you would think even though I do give you the life expectancy of the breed. Time flies by and before you know it your dog has grown old and is ready to leave this world, so please make sure to love them and take care of them until their time is over. There are a few of the breeds above that I know would fit into my life right now and would just love to have, what about you have you seen any that really interest you? Feedback is so welcome from all my readers, please leave any comments, suggestions, or questions in the space provided below I do reply to them all.